Crosshole Seismic - Hager-Richter Geoscience, Inc. : Hager-Richter Geoscience, Inc.
Crosshole Seismic Surveys are used to obtain in situ properties of soil and rock strata. Often used as part of a comprehensive geotechnical investigation, the crosshole seismic survey yields valuable information as to the strength and cohesiveness of the underlying sediment and bedrock, information that is critical to any engineering endeavor. Crosshole Seismic Surveys measure the time for horizontally traveling compressional (P) and shear (S) waves to travel from a source hole to a receiver hole. Travel times are used to determine P and S wave velocities, which can be used to compute Poisson’s ratio, as well as the other elastic moduli. 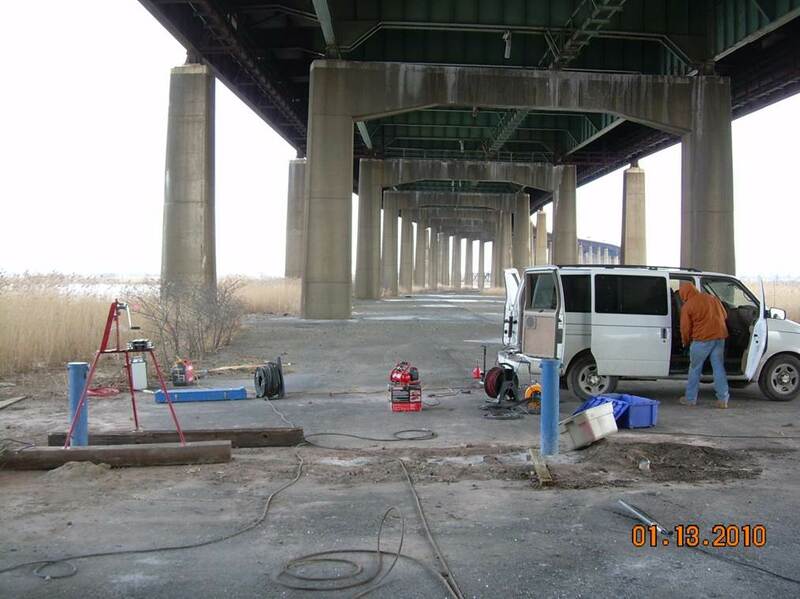 Two or three borings spaced 10 to 15 feet apart are used for crosshole seismic surveys. The boreholes must be prepared in accordance with ASTM D 4428/D 4428M-91. The distance between borings at every measurement elevation must be precisely determined for subsequent velocity calculations. 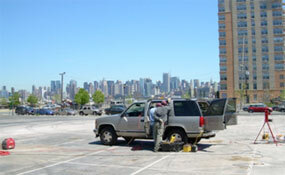 Since distance between borings can vary with depth due to deviation of the borehole from verticality; Hager-Richter always performs a borehole deviation survey as part of the crosshole survey. Once the deviation survey is completed, the seismic source is placed in the first boring and clamped to the boring casing while generating a seismic signal. The seismic signal travels as an elastic wave to a three component geophone that is positioned at the same elevation in the receiver hole(s). The time and distance data are analyzed and interpreted to determine soil properties. Our extensive experience and ability to innovate when necessary are what makes Hager-Richter special. It’s also what keeps our clients coming back time and again. State-of-the-art equipment, such as our Geometrics Geode 48-channel digital seismograph, with its high dynamic range, allows us to accurately pick first arrivals of both compressional and shear waves. Crosshole seismic surveys conform to ASTM standards so our clients know they will get consistently reliable data, and the attention to detail and commitment to excellence by Hager-Richter’s technical staff ensure the highest level of quality control for every project from start to finish.